When planning, I like uniformity. I realize the world uses a basic calendar with varying holidays depending on the country, but I need something that makes sense to me. As a web based entrepreneur, I work mainly from home and have to post and interact with others when they are working, usually Monday through Friday. I’ve tried a lot of solutions, but most get really complicated, quickly. Personally I like to look at a calendar and know where I’m at without some crazy formula. I’d like to share with you a simple solution that you might find useful. It’s part of a Life Planning system that I’ll be releasing later in the year. Here is an excerpt from the workbook. For this post, I want to explore a 50 week year. To create this I just took a regular calendar and started counting from the first full week. For 2015, this week starts on Sunday, January 4th. I just numbered down from there. It ends in the middle of December, with two weeks off at the end of the year. This is what it looks like. I divided the week into a planning day (Sunday), five work days (Monday thru Friday), and a wrap up day (Saturday). Basically modelling it around the most standard work week that most businesses use. I just numbered the start day of each week with the regular calendar day it corresponds with. Now that I have 50 weeks laid out, I can divide this up into meaningful chunks. Using the 5-10-50 system, I can easily divide the year up into five, ten week sections. In my experience, ten weeks is an ideal length for many goals. You can easily lose 10 pounds, write an ebook, train for a 5k run, finish many types of projects, and generally have a time period that is easily divisible and makes sense. Maybe you are catching on to my idea here. With 5-10-50 I don’t have to do radical math to figure things out. The backbone of the system is the 50 minute priority hour. This allows you to do one priority that you have for the day for fifty minutes straight, and then take a ten minute break. Just set a timer for fifty minutes, turn off all distractions, and go. Repeat as necessary throughout the day (I can usually work three or four of these in to my usual work day). Fifty minutes is easily divisible into five and 10 minute chunks (already delineated on the clock) for getting shorter tasks done. This system has revolutionized the way I work. By single-tasking in fifty minute chunks, my productivity has soared. Maybe you can see how easy it will be to plan out your projects. For shorter projects, you can use 5 week time periods, or divide it up any way you want. 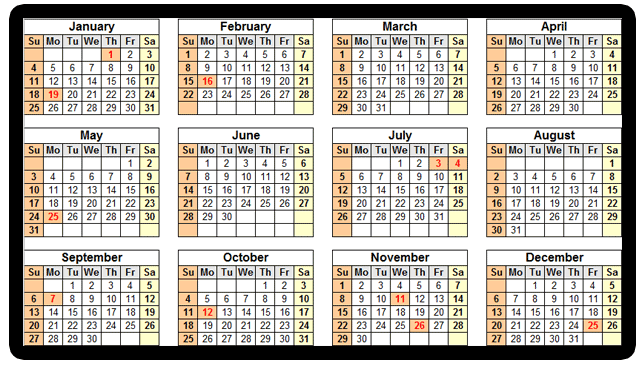 Here is another cool thing, If I want to take off a week during the year, I just change the start dates on the calendar, and add another week at the end of the year. Obviously, the real world is not this organized, throwing in holidays, deadlines, and milestones based on a traditional calendar. As an entrepreneur, I have a more flexible schedule than many people, but for overall planning you may find that helps you make sense of your year. 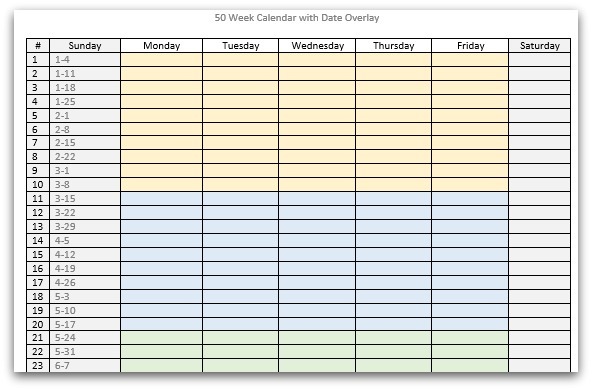 Here is a PDF copy of a fifty week calendar divided up into 10 week sections. The beginning date of the week is listed in the first cell. Over the next few posts, I’ll show you how cool this system is, but for now you may want to play around with a 50 week calendar. With 50 weeks in your year, you can easily divide projects up, set goals, decide which weeks to vacation and easily figure out how many hours you’ll need for completion.